In my humble opinion, Valentine’s Day should be all about the ladies. The holiday is all about hearts, flowers, and all things pink, so naturally it lends itself to a more feminine vibe. In the past few years, I’ve seen the idea of “GALentine’s Day” catch on in a major way, and I’m like FINALLY! Max and I don’t really celebrate v-day, and having a holiday to celebrate my gal pals makes so much more sense in my book. This year, I decided to host my first ever GALentine’s Day Party! I had so much fun decking out the house with festive pink décor and planning the event. It really filled that holiday void leftover from the Christmas season! 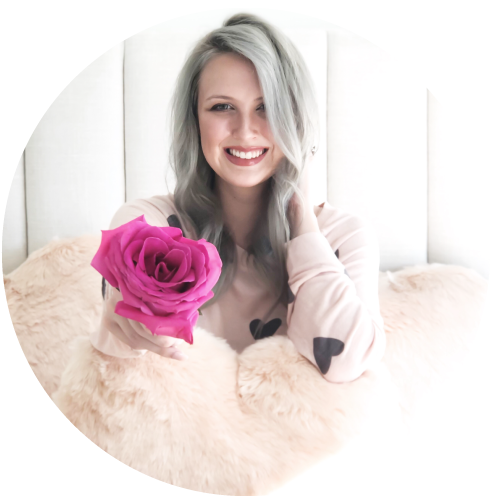 I enjoyed hosting my event so much, I wanted to share with you how to host your own GALentine’s Day Party! I’m linking all of my décor and talking guests, menus, you name it. Read on for all the deets! If you’re just like, give me the links girlfriend, you’ll find all products (plus my outfit!) linked at the bottom of the post! I kept my guest list small (just 8 ladies, including myself), because I wanted the party to feel intimate and cozy. The small number allowed me to do a sit-down brunch, and largely contain the party to my main dining room and foyer. I loved having the ability to focus the party into one area of the house, so I could go all-out on decorations there without feeling like I needed to make the entire house pink. If you read my recent post about my favorite Valentine’s Day home décor, you know that while I love the idea of festive decorations for any occasion, that does not mean that they have to be a radical departure from your everyday style. Just because something is pink, does not mean it cannot also be chic. 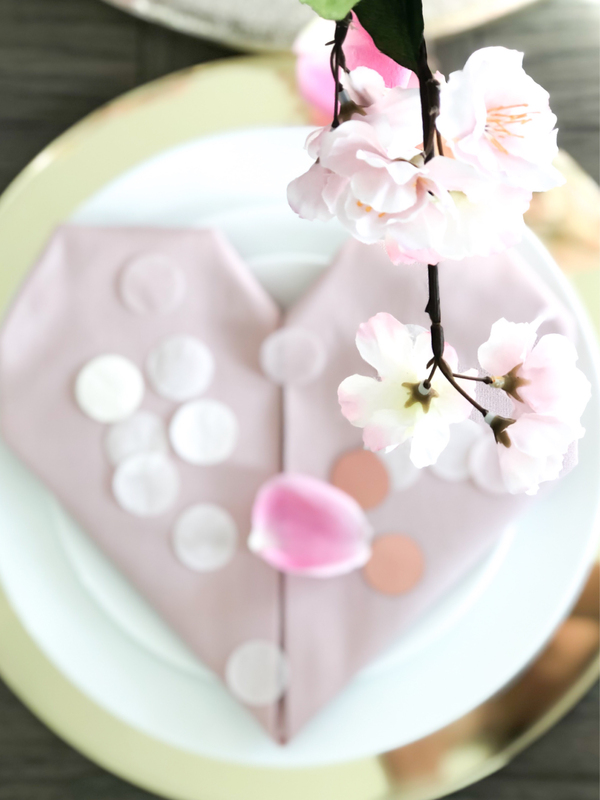 In fact, I’ve had some of my GALentine’s party décor, like these faux fur heart pillows and my cherry blossom centerpiece, on display all month. I put up some of the more overtly party-centric items, like this tassel garland and this metallic love balloon, the day-of. I just think it’s nice to have some of the décor on display for the whole season, rather than just one day. Don’t you agree? I kept the color scheme to the pink and blush families, which I think is lighter and airier than red. The pink florals also remind me of spring, which I know we’re all longing for these days! I also asked my guests to wear something pink, which added to the overall vibe. I saw this heart napkin fold on Pinterest, and I just knew it would be perfect with my pink napkins! There were several tutorials to choose from, but I found this one worked best with my napkin size and thickness. I used an iron to really press the folds into place and they were actually really easy to transport to the table without falling apart! This party was the first time I got to showcase our new bar cart (which is currently on sale for 20% off! ), since it did not arrive in time for Christmas. I loved putting together such a colorful display, especially since my house is so neutral (who’s surprised?). I’m already dreaming of the hot chocolate bar I’m going to have next holiday season! The cart also comes in silver AND a round version. I love my little champagne bell! Now that we have a bar cart, I think I’ve found it’s permanent spot! You can my exact one linked here (I have the French ringing version). Normally, I would’ve used this occasion to make my favorite floral ice cubes, but since I recently found this glass ice bucket (sold out, linked similar), I decided to just toss in some fresh mini carnations for a more whimsical, less-done effect. I thought it turned out so cute and colorful, and was not nearly as time consuming as the floral ice cubes! I’d been lusting over these pink coupe glasses F O R E V E R (seriously like YEARS) and I finally decided to pull the trigger and purchase them for this party. They are so elegant yet girly and I am obsessed. Like my love of faux furs, I have a serious weakness for glassware. I can never have enough, and I’m just glad I have a lot of cabinet space in my house haha. As I said before, I kept my guest list small so that I could have a sit-down lunch rather than serve-yourself appetizers and snacks. My menu is based on a small, intimate group, but you could easily scale up your event if desired! Upon arrival, I served everyone a glass of sparkling rosé (in these adorable pink, gold-rimmed coupe glasses!) and I had a cheese and charcuterie board on the table as an appetizer. I think most of my friends and family would agree that we could’ve stopped there haha! I’m lucky that my favorite ladies are all obsessed with cheese and champagne like me…they’re an easy crowd to please! Once everyone was settled in, we sat for the salad course. I served an arugula salad with strawberries, pecans, and goat cheese topped with a balsamic vinaigrette. The best part was that I could prep this entirely in advance, and just plate and top with the dressing when it was time to serve. The salad looked beautiful and tasted delicious, but was overall extremely low-maintenance. For the main course I decided to make my Instant Pot mushroom chicken risotto. You guys. This recipe is sooo good and beyond easy. It’s a true one-pot meal and the Instant Pot does all the work! It’s the perfect dish to serve for a group and since you don’t have to actively cook it, you can spend more time with your guests. I’ll be sharing the recipe this weekend, so be sure to check back! Since my cooking skills do not extend to cake decorating, I decided to pick up the desserts from a local bakery. If you’re in Atlanta I LOVE Sweet Hut Bakery for any occasion where I need beautiful and delicious desserts. I used them two years ago for my bridal shower and now they are my go-to for cute confections! Since I did not need a ton of desserts for this event, I just popped by the day-of and grabbed whatever they had on hand, but you can also place larger or custom orders in advance. I also couldn’t resist getting a few cupcakes from Georgetown Cupcakes, because they are just divine! Overall, the event was so much fun and I plan to make it a tradition going forward! I’m already planning a bigger event next year! So, what do you guys think? GALentine’s Day or Valentine’s Day? Let me know in the comments! Also, if you’re thinking of throwing your own GALentine’s event, please let me know! I would love to hear what you’re planning and answer any questions you may have! Don’t forget to shop all of my décor and my outfit below!